French repoussé, also called “hammer and stake raising”, is one of several repoussé processes. 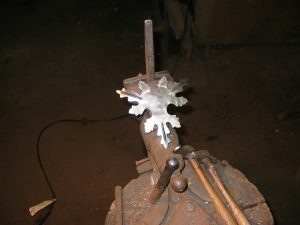 This method utilizes several small raising hammers, that lightly strike the sheet metal over various stake forms held in a vise. Another process involves “sinking”, by using various punch-like forms to force the sheet metal into iron or wood stakes and stumps. This method is often used in conjunction with the French method. 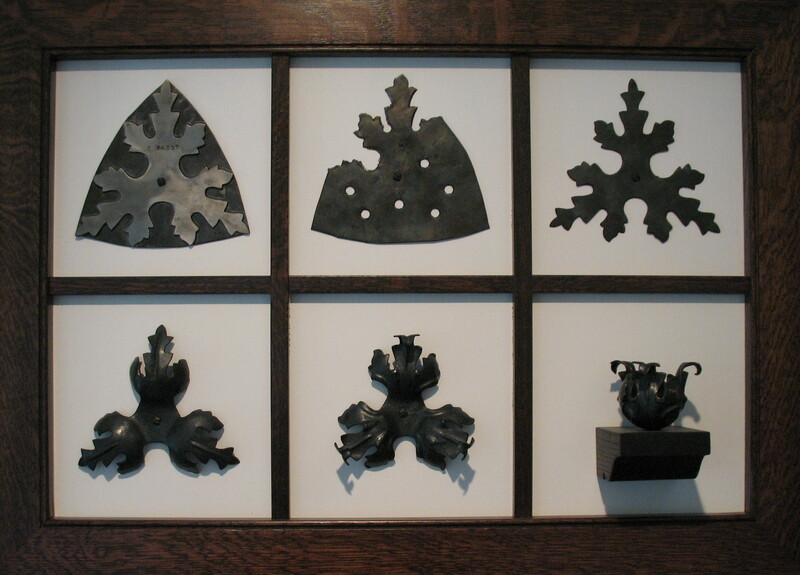 Still another repoussé process uses“pitch”, which uses a stiff, but slightly soft pitch, tar or even plasticene as a back-up to the sheet metal. 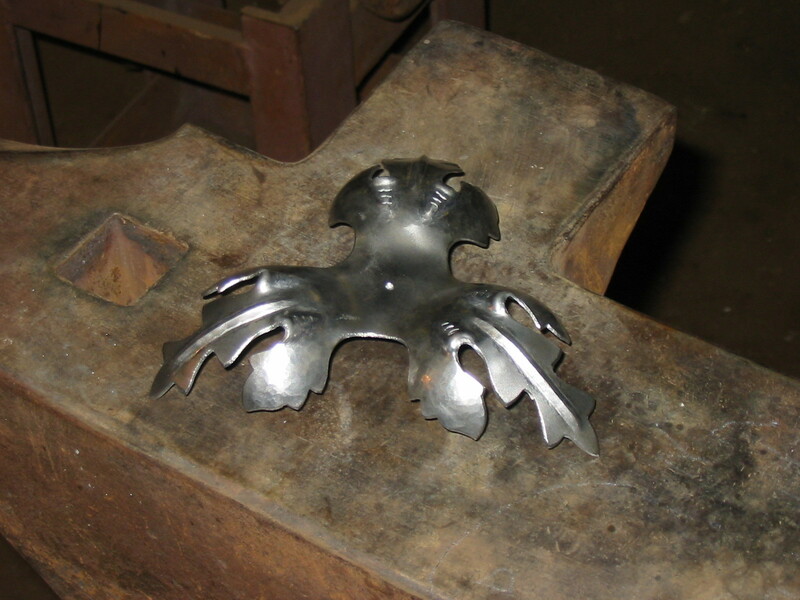 One then delicately forces the metal down into the substrate (pitch) with various, typically tiny, punches. How does a leaf evolve from a flat sheet into a flowing form? 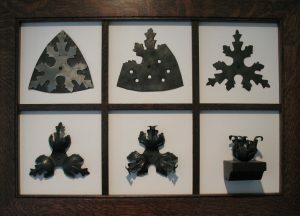 The story board below shows the progression of a leaf, or in this case, a husk (or calyx) using the French Repoussé technique. 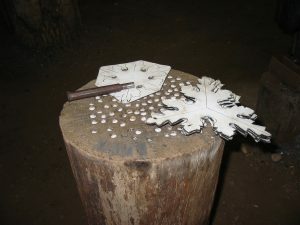 The first stage , in the upper left, shows the master pattern (bright silver) on a darker sheet, which will have the pattern traced out on it with a steel scriber. The pattern is shown in the next panel as partially cut with tiny chisels, some straight, and some curved chisels. The third panel shows the pattern filed to a finished shape, and ready to form on the stake with a raising hammer. An alternative to scribing the pattern from a pre-made master is to photo-copy the pattern, then cutting it out and applying it to the sheet metal with a spray adhesive. The image above shows just such a pattern after being rough cut in a band saw, then finish filed to shape. 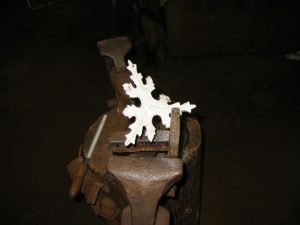 Notice the filing vise holding the pattern, which allows the piece to be filed at a 45 degree angle. The image below shows a punch, and a stump used to make holes which automatically form the radius at the bottom of the gores. The wood offers enough back-up to the metal to punch through the metal without too much distortion. The punch is slightly dished, sort of into a fishtail shape for more of a shearing action. 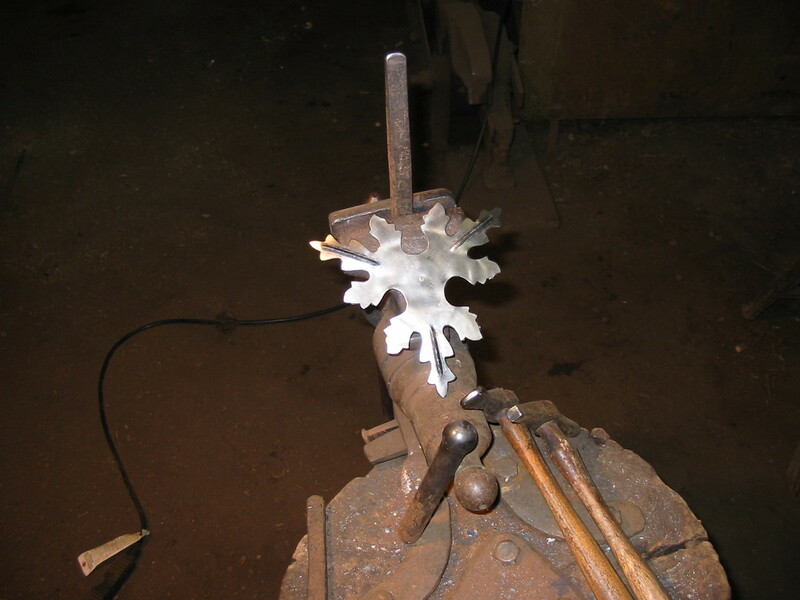 Punching goes much faster than drilling, and leaves less of a burr. The above image shows the “general purpose” stake used to put in the center veins, as well as some of the lightweight hammers used for the job. The image below shows the stump and hammer used for the next step. Lead could be used for this step as well. Notice that the middle of the pattern has been left alone. This allows the stakes and hammers easier access to the piece, as well as for further development in the final shaping into the husk form. The image below shows further development in the larger gores, (or sinuses) of the main three leaves in the husk. 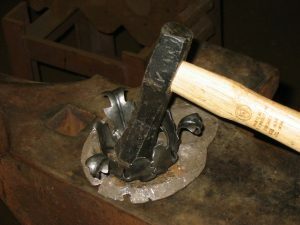 This was accomplished by initially raising on the stake, and then enhanced with a U-shaped dimple using a lead back-up, and a small curved punch. Added detail comes from adding curved chisel marks on these small veins. The final form is then accomplished by sinking the pattern into a lead or wooden form with either a round faced hammer or punch. 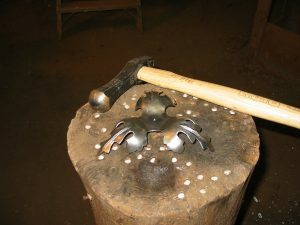 It is further refined by “planishing” (smoothing with a small polished hammer) on a 1 1/2″ round ball, mounted atop a stake. Below shows the bobeche development on a story board. This piece was made entirely by sinking into stumps and other dish-like forms. 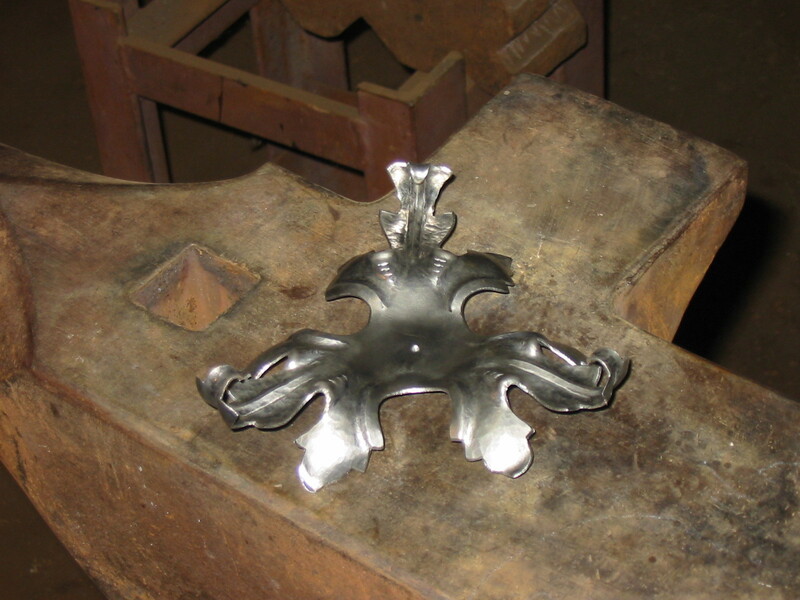 The image below shows a mock-up of the two pieces as they were applied to the chandelier. 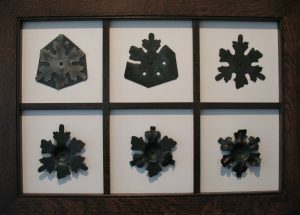 The two story boards and the example above were made for the Cyril Colnik gallery at “Villa Terrace Decorative Arts Museum”, also in Milwaukee. 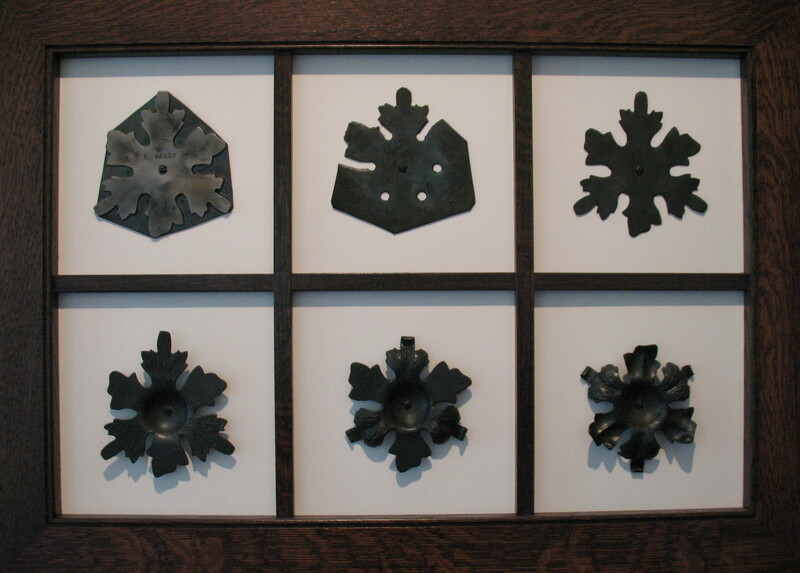 Tom Latané (a friend, blacksmith and woodworker from Pepin, WI) made the two wood mounting boards, as well as the wood escutcheon for the combo piece. Please note: This entry serves as an overview, as it would take quite a lengthy text coupled with numerous images to be absolutely clear as to how the process unfolds. 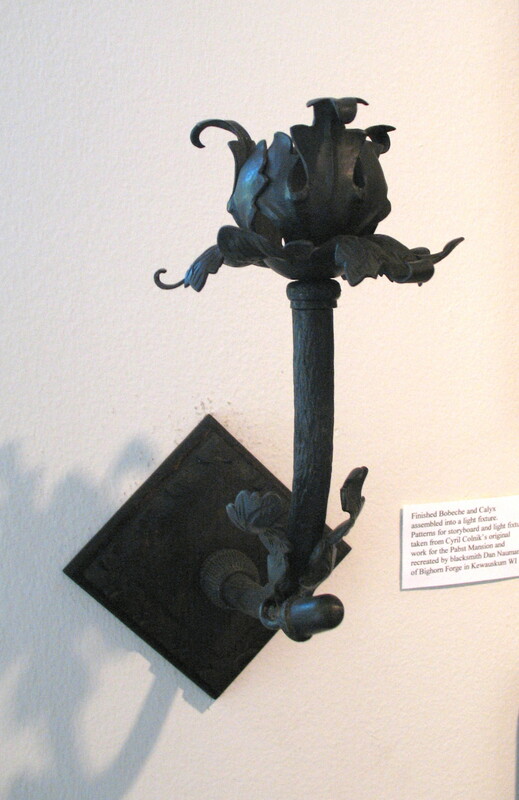 This entry is simply designed to give a basic understanding of the repoussé process. ……Tom Brokaw, NBC News Anchor. Greetings Dan, Just found your site and words can not describe how impressive all the information is. Your attention to detail is fantastic and your willingness to share processes. Difficult to find good examples here in MS that will challenge myself and others to move to more daring works but your site has done just that. Saw you in Memphis a few years ago and look forward to seeing you at the ABANA conference in Memphis next year. I’ve many questions about Colnik’s work but time doesn’t permit here. Maybe I can talk more to you at some point in person. Spent 5 days a few years back with Tom Latane’ in his shop in the middle of Jan. Never been so cold in my life (15 below zero in middle of day when getting off plane). Take care and keep up this fantastic site – INSPIRING! Glad you like the blog. It for folks such as you that I do this, i.e. folks looking for things they cannot find elsewhere, and also folks looking to push their capabilities. Thanks for the comments……see you in Memphis.